Amber G. Johnson spent the fall of 2016 studying abroad in Berlin. 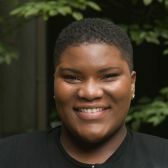 A student of Spelman College, she spent her time there studying Afro-German history, while at the same time immersing herself in the German culture. She is majoring in Comparative Women' Studies and Political Science and is volunteering her free time to serve as a DAAD Young Ambassador to promote Germany as a place for study and research abroad. What sparked your interest in Women’s Studies and Political Science? I’ve always been interested in the politics that influence the African American woman’s experience. When I say politics, I am not talking about public policy, voting and elections, although those things are important, but I am talking about the search for identity, experiences, and systems of oppression that influence the African American woman’s experience. It took me two years to find the right major(s) that would assist me in analyzing these concepts and with the help of the Spelman College Political Science Department and Women’s Research and Resource Center, I have been able to accomplish my personal and academic goals. I am simultaneously working on two ongoing research projects. One focuses on the experiences of black girls with discipline within the education system and the other is somewhat of an analysis of the Afro-German experience and the documented experiences of the Afro-German people. Although these two projects may seems completely unrelated, they both analyze the politics that silence and misrecognize Afro-Germans and black girls alike. Throughout my research and as I read various texts about the two groups and their experiences, I see similarities in their narratives when they speak of the identity crises that they fight internally and as a triple entendre. To be black, female and American. To be of African descent, female and German. What was the most ‘German’ experience you have had? This is an interesting question because I’d like to believe that no one ‘German’ experience is alike, especially as a person of color. But one experience I do recall is an experience that I hold near and dear to my heart. While I was abroad my mother came to visit me and we had the opportunity to assist Günther Schaefer in the restoration of his landmark mural “Vaterland” on November 9th 2016. This day is important because four world changing events occurred on this date. The first being the end of the German Monarchy in 1918, then the failed Nazi Beer Hall Putsch in 1923, the “Kristallnacht” Anti-Jewish Programs in 1938, and in 1989 The Fall of the Berlin Wall. This mural, located in the East Side Gallery, is a protected German monument and a warning to future generations of the dangers of fascism and fundamentalism. This service made me feel as if I was included and accepted in the German society and served as a highlight as well for my experience studying abroad in Germany. Like all fields of study, you have to do your research first before you make a decision. Also, think long and hard about the impact you want to make one the world and when you enter this field of study, take this work seriously because it is the work of feminists and suffragists that has shaped and uplifted the world that we live in today. Last but not least, this will also depend on your school as well, but be ready to ready and not just read to finish the assignment but also read to understand the text and develop your understanding of the topics discussed. This field of study has definitely challenged my thought process and changed my views as well, so if you are not ready to be challenged then this is not for you. What advice would you give to North American students who are thinking of studying abroad in Germany? As I stated above, do your research before you make a decision. Choose a program that will enhance your experience as well, not only as a student but also as a resident of Germany for however long you decide to study abroad in Germany. I knew that I wanted an intercultural experience and I chose my program because it was located in the middle of Berlin Kreuzberg. This area introduced me to the progressive and diverse Germany that is learning to accept its past and not only welcomes but also encourages diversity in its neighborhood. Not all programs will give you this experience so research the location of the program, talk to the program coordinator about opportunities to get involved in the community that you will live in and most importantly, remain open-minded and leave your preconceived notions about Germans in the United States. Which pictures, plants or unusual objects are there in your room/at your desk? At the right side of my desk I have a lock heart shaped bookend that hoists up the thirteen required texts that I have for my classes this semester. These texts range from The Immortal Life of Henrietta Lacks by Rebecca Skloot, Sister Citizen by Mellisa Harris Perry, to What I Know for Sure by Oprah Winfrey. At the left side of my desk, for some reason I have a pack of toothpicks that I brought home with me from Germany. Before I left, I purchased in bulk my favorite toiletries and when I use the products I practice my German when I read the labels. Can you cook a German meal without a recipe? If so, which one? Do you have a favorite writer or politician? Or someone who has inspired you on your journey? If so, who and why them? My favorite writer is Audre Lorde because of her scholarship, poems, and influence on the Afro-German student population during her time as a professor in Berlin. She lived in West Berlin in the 1980s and during her stay as a visiting professor at the Freie Universität, she was the mentor and catalyst who ignited the Afro-German movement. Learn more about the DAAD Young Ambasador Program.